The Tactical Solutions 22/45 Magazine SLAM Extended Magazine Base fits all 22/45 magazines. 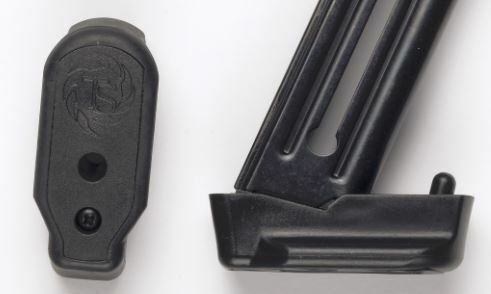 The spring loaded plunger in the base makes sure that the magazine is ejected out of the pistol when the magazine release button is pushed. It's the same magazine base used in the Tactical Solution's S.L.A.M magazines. I have one mag that does not have this and it is a PIA to use. Without it I get FTFs and FTEs. It is a real plus for the 22/45. I have been using these for several years (local LGS idea)prior to TS offering and would highly recommend to anyone with a Ruger 22/45! The TS product is probably the best upgrade for the 22/45.